Celebrating the milestones of time is a uniquely human thing. It’s something we do to recollect where we’ve been and give pause to reorient ourselves to where we’re going. 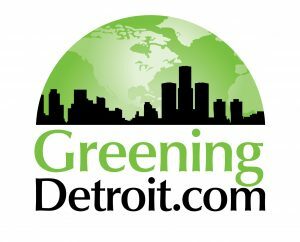 This past Thursday, at Hop Cat Detroit, SMSBF continued its tradition of marking the passage of another year with its “Sustainable Resolutions Celebration”. The room was the same as last year’s event (December 2017), and the weather was almost as uncooperative, but time had brought changes and new energy. As creatures marked by history, we’re different than we were last year. Life changes. Life evolves. We become more of who we’re meant to be. When we come together – face to face – and celebrate a moment in time – the passing of another year – we sense a difference in the atmosphere. There was an energy at Hop Cat last Thursday – a vibe – that was different: it gave hope and a sense of wonder. Dawn Hetzel, from Coeus Creative Group, served as emcee for the evening, engaging the crowd with energy and enthusiasm. First to speak was Mike Shesterkin, SMSBF Executive Director. Using the “Blue Pill or Red Pill” scene from the movie, “The Matrix”, he challenged our view of reality, the traditional world of “corporatism”, “shareholder value theory”, and whether the market really can solve humanity’s pressing challenges. In closing, Mike pointed to hope on the horizon – describing how local business leaders and inspiring entrepreneurs are striving to create triple bottom line value that results in a better community for everyone. After those thought-provoking opening remarks, SMSBF recognized its outgoing board members, thanking them for their years of service and dedication to the Sustainable Business movement. Those recognized were: Susan McCabe, of Ribbon Farms Hops; Noel French, of Thrive Legal; Dave Crumrine of US Ecology and Erin Quetell, of the City of Ferndale. Also recognized and introduced was the 2019 Board of Directors: Rebecca Dray, of the Social Enterprise Alliance, Dylan DuVall, of Hubbell DuVall, Chris Meincke, of GHD and Patrick Judd, of ECT. After weeks of speculation and anticipation… the 2018 Triple Bottom Line Business Leader Award was announced! Rising to the top from the 7 nominees was Any Peterson, co-founder of Rebel Nell! In accepting the award, Amy remarked that it was inspiring to be recognized for the work Rebel Nell is doing to make a difference in the community. The award itself was produced by The End Grain Woodworking Company, which is locally based in Metropolitan Detroit. Nominations for the 2019 award will be opened at the SMSBF’s upcoming Triple Bottom Line Forum, on Thursday, June 27that Wayne State University. Throughout the evening there was plenty of time for food, drinks, networking, meeting new friends, and making new connections. 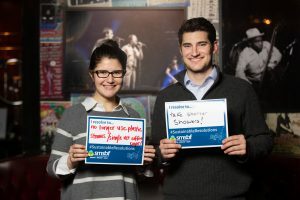 Attendees also had the unique opportunity to memorialize their Sustainable Resolutions for 2019 at the SMSBF Resolutions Photo Booth, hosted by local photographer, Geneva Simmons. The resolutions sparked creative ideas to reduce and eliminate harm to the environment and lift-up the common good. The evening’s programs concluded with an intimate “Conversation with Andy Hoffman,” facilitated by our emcee, Dawn Hetzel. Dr. Hoffman, the Holcim (U.S.) Professor of Sustainable Enterprise at the University of Michigan and author of numerous books, including How Culture Shapes the Climate Change Debate, did not disappoint, offering insightful conversation on several topics, including the unprecedented times in which we live. Hoffman shared several anecdotes and stories including the hope he sees for the future in his students to conversations about climate change during a round of golf! He reflected on ideas shared in his books about the effects human behavior is having on the Earth’s environment. He also shared practical tips on how to engage in conversation about this and other complex challenges in a way that is relevant and relatable to our day to day lives. Cultural changes are underfoot as well, except these shifts are not as easy to characterize. Today’s emerging cultural shifts are reflective of the extent to which the needs of large portions of the world’ population – especially the poor, at home and around the world – are being met. The question is whether we can move toward a system that creates fair, just and equitable distribution of Earth’s goods and services; if we cannot, the precipice on which we currently stand will crumble, and where we land is anyone’s guess. 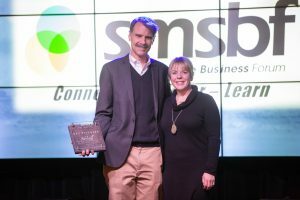 The SMSBF Sustainable Resolutions Celebration brought together a group of thoughtful individuals and business leaders – people who have hope for the power of localism. This community knows what can be done locally to shift the present course and make the entire world a better place. The leadership at SMSBF is humbled and eternally grateful to have had the opportunity to meet and spend time with such a wonderful community. 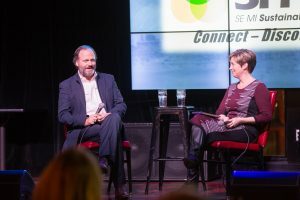 At SMSBF, our desire is to build on the energy that flowed last Thursday evening, and inspire action – action that moves our community toward a commerce for the common good, and ultimately, sustainable human existence.